Holy mother of God. Season 3 of Mad Men premiered at L.A.'s Directors Guild of America, and you better believe it was awesome. 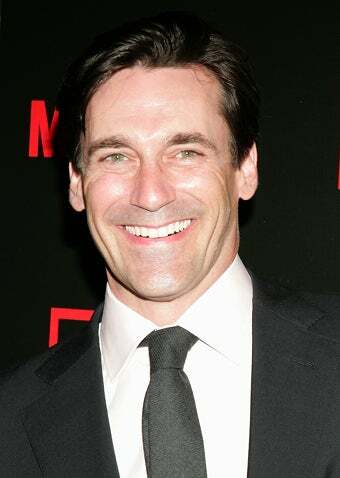 Sure, no one ever looks quite as amazing as on MM, but Hamm and Hendricks? We're there. Oh. My. God. Everyone's girl-crush Christina Hendricks' bizarre, inventive, sinister dress is a bright spot of awesome in a world of styled safety! Vincent Kartheiser looks like a guilty little boy, but maybe that's the Pete Campbell hair; it's gotta be rough keeping it early-60s long all the time. I was all about Betsy Brandt's cruisewear special until I reached the bizarre tribe-of-Tory-Burch yoke. Even given my distaste for purple in all its iterations, gotta give Anne Dudek full marks for her lovely, delicate accessories and dash of sass. The main question is: did Jared Gilmore choose his own outfit, or did his mom dress him like a miniature Sky Masterson? Aww, Kiernan Shipka looks Sally Draper sweet! And best casting in the world: how much does she look like January Jones? Elisabeth Moss looks lovely and loving the sea green. Fiance Fred Armisen is one of those comedians who always seems to be in character - like now he's just playing someone serious. Maybe an inevitable consequence of SNL? Robert Morse will always have a place in my heart for How to Succeed in Business Without Really Trying. And how sweet is it that he brought his grandson as his plus 1? Ok, corset-style breast-framers have been among my betes noires for the past 20 years, but will say that Melinda McGraw's looking delightfully Casino: a nice nod to the show. I think it's the combination of "relaxed" fit, loosened tie and three-piece that makes Aaron Staton's getup look kind of absurd. Like, dude, you're obviously trying really hard. Dana Delany also nods to the show's rad costuming. I'll admit it: as a nerd, I'd have loved to see a vaguely-60's closed-toe, but I get the impulse to mix it up. At first glance, found Alison Brie's party frock overly fussy. Being fickle, now I love it. What say you, gang? I'm just gonna say it: what's going on with Jon "Perfection" Hamm's crotch?